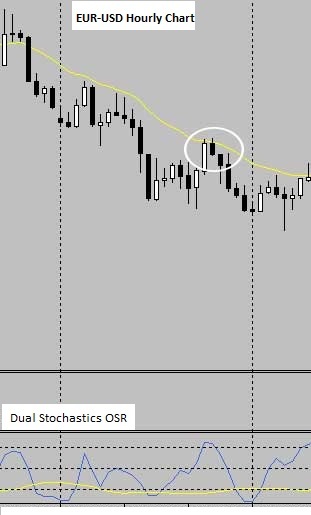 Using a single stochastic indicator on your charts is limited in what it can tell you about potential future price movements. But if you use two stochastic indicators, one fast and one slow, then you have a significantly greater chance of profiting from a stochastic signal. 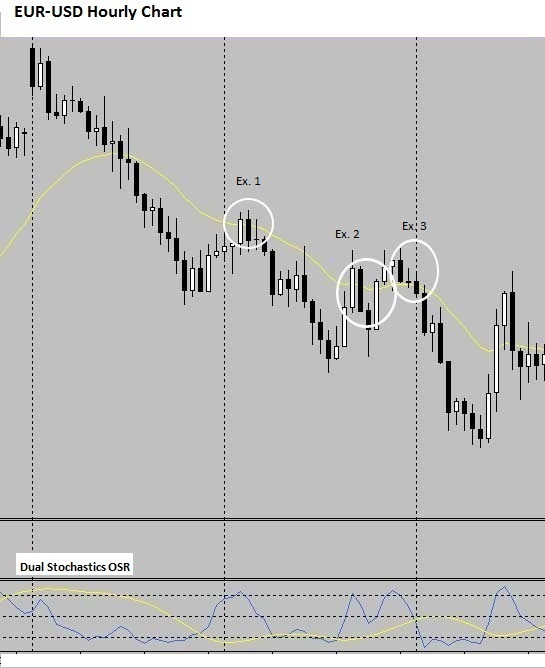 The Forex dual stochastic trading strategy uses both a fast and a slow stochastic, and requires each stochastic level to be located at polar opposites. The standard extremes for a stochastic indicator are the 25 and 75 levels, although most traders recommend – and this strategy requires – traders to use 80 and 20 levels. After applying this approach to your own charts, you’ll notice that after the stochastics are overbought and oversold, they will then collide or approach each other in the middle, which indicates price abruptly fell or rose. You might also notice a supporting candlestick formation aligning with the overbought and oversold stochastic levels. The slower stochastic will move more in a straight linear line while the fast stochastic moves around erratically. For extra confluence, you’ll want price to bounce against the 20-EMA while the stochastics are at extreme opposites before entering a trade. Overall, this is a simple, intuitive trading strategy that can fit perfectly alongside any other trading approach. With this Forex strategy, you can bend the rules and tweak settings as you see fit, so you’re not stuck with a robotic, purely mechanical trading system. This trading tactic can work for any type of trader, no matter their experience, skill level or account balance.